Happy New Year folks! 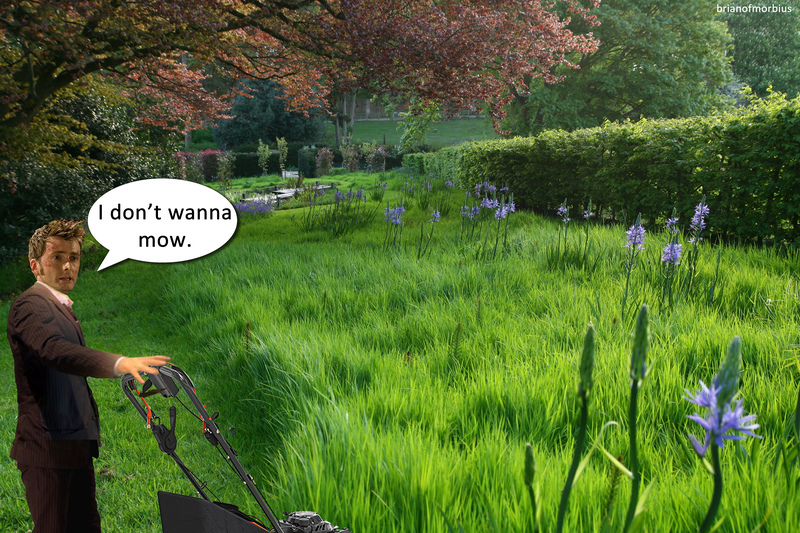 Meet David Tennant, the reluctant gardener. Elsewhere in Whoville, one of Jackie Tyler’s leftover Christmas cracker jokes goes awry. 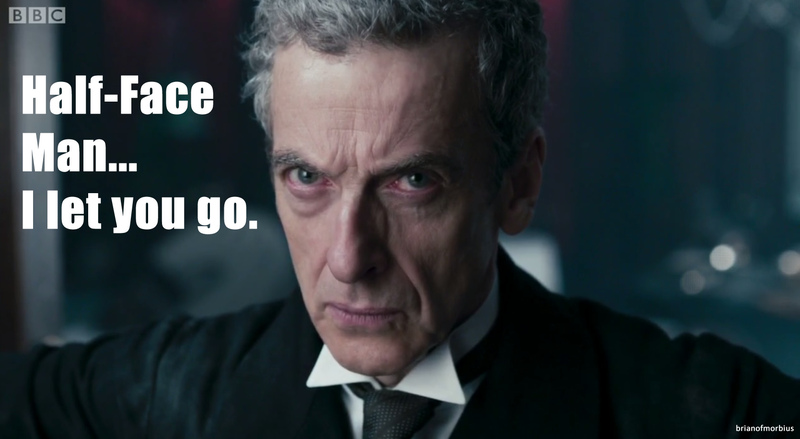 And finally, here’s the Twelfth Doctor’s confession. Well, I’m glad we’ve cleared that one up. Addendum, mid-March: EMI, the money-grabbing bastards, have decided to block this worldwide. I wouldn’t have minded but it was fine when I uploaded the thing. In any case, it can’t be helped, so I’ve included the Viddler link. It should now work. 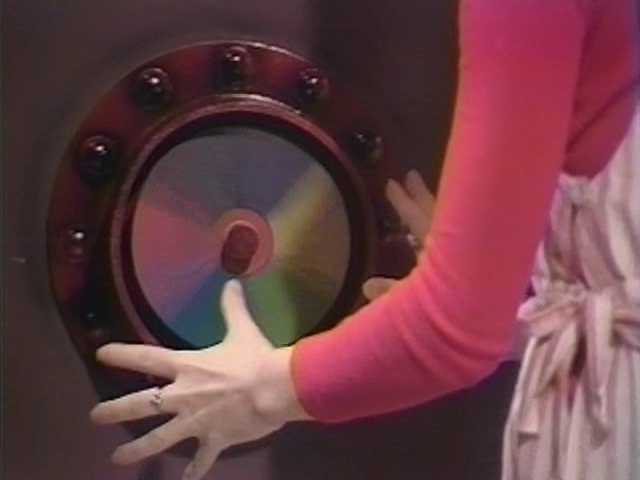 The first question: Can you, in fact, get enough footage for a six-minute Kraftwerk song from a single episode of Doctor Who? The answer is yes. Almost. When I was in my early twenties, at the halfway point of a course I abandoned not long afterwards, I taught a creative writing seminar for the rest of our teacher training group. My friend and I agreed at the time that the best way to teach creative writing in a classroom was to focus your students. If you give them a blank sheet and tell them to write a story, you’ll get a lot of procrastination. But if you tell them to write a story about X, or in Y words, your results will probably be better. We communicated this to the group by means of references to Jerry Springer, Peanuts and Bagpuss. Some thirteen years later, I still believe that the occasional bout of enforced concentration is good for the soul, and that’s what I had in mind when I put this together. It stemmed from my initial play-through of Trans-Europe Express on a cold January afternoon – its sparse electronic landscape a perfect accompaniment to the wintry scenes I surveyed around me – and the realisation that ‘Showroom Dummies’, with its minimal (but cutting) lyrics, was perfect subject matter for a video about the Autons. And more to the point, no one appeared to have done it yet. Which gave me another chance to land-grab, and that’s great, but why has no one done it? ‘Rose’ is seven years old, and there are nods to the Kraftwerk / Doctor Who connection all over the web if you look, so why did no one think of marrying these two before now? Presumably people have less screen-time and more of a life? Focussing on one episode made me scour it with a greater intensity than I usually afford these things when I’m doing a montage. You look for the silent glances, the meaningful stares. In the end I think it came off rather well, but I admit I ran out of steam at around the five minute mark, so you get an early fade. Still, you do get to see the Autons dance, after a fashion, so it works. 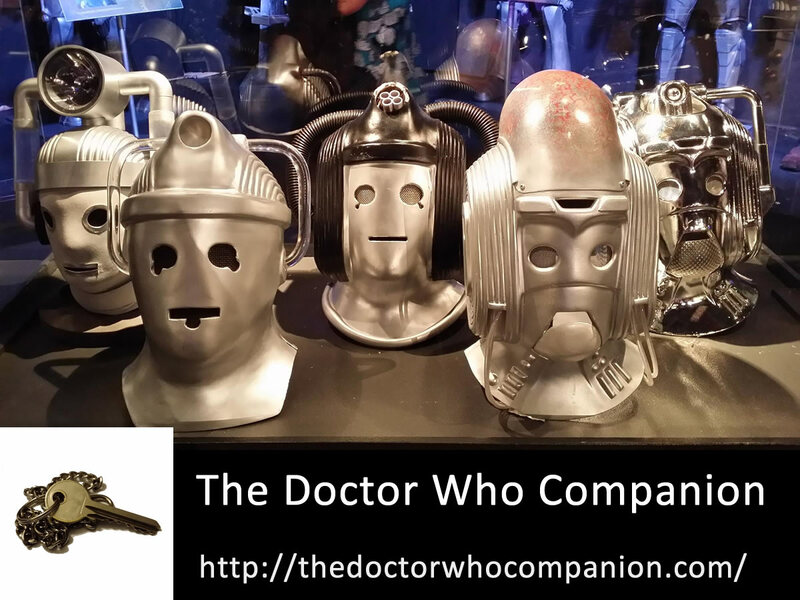 There is, almost certainly, another version of this video somewhere containing footage from ‘Spearhead From Space’ and possibly even ‘The Pandorica Opens’. But I won’t be making it. I think I’ve had enough of Kraftwerk for a while. I’m off to listen to Jerry Springer instead. When Rose Tyler left Doctor Who, it was announced with a three-month build-up, a flurry of trumpets, a blitzkrieg of press releases, a cacophony of strings (scored by Murray Gold) and a bucketful of mournful looks from The Doctor, along with assorted sobbing from Billie Piper. There was a reference to Face/Off as both characters stand on opposite sides of a wall that’s a universe thick. Then there is a scene on a beach (Southerndown, passing for Norway) that makes me retch. Then there is a lot of mourning and anguish and then a period of denial, and then an inexplicable return (with incredible teeth) which basically undermines the pathos of the entire departure. When Sarah Jane left Doctor Who, thirty years earlier, there was a thirty second monologue and then the Doctor drops her off in Aberdeen. And that’s it. In the next story (which I’ll explore another day) he’s on his own. Things were simpler in those days and we were allowed to move on, a luxury that is seemingly missing from much of New Who (at least until Moffat’s mini-reboot, which required that we move on quickly from the Davies era but simultaneously memorise absolutely everything that the new chief writer chose to tell us, because even the presence or absence of the Doctor’s jacket was important). These days, we are forced to acknowledge, with an undercurrent of tinkling piano, that these departures are A BIG DEAL FOR THE DOCTOR AND THEY HURT HIM. AND IF HE IS UPSET, WE SHOULD BE. ARE YOU SAD YET? ARE YOU? I SAID ARE YOU? The BBC re-screened ‘The Hand of Fear’ last spring, in the wake of Elisabeth Sladen’s death. Given that it’s her final Classic Who story (until ‘The Five Doctors’, which doesn’t really count) it was, I suppose, an obvious choice, but it’s a strange and slightly uneven four-part narrative that jumps about from place to place and never quite finds its footing – ‘The Time Warrior’ or ‘Pyramids of Mars’ are better tales (and both are trumped, of course, by ‘Genesis of the Daleks’, but that’s really more about Michael Wisher). ‘The Hand of Fear’ does, however, feature some of the most outlandish Sarah Jane moments in the original canon, which we’ll get to later, so whatever its flaws it’s never less than interesting. We open with a shot of a paperweight sitting in a Blue Peter volcano. 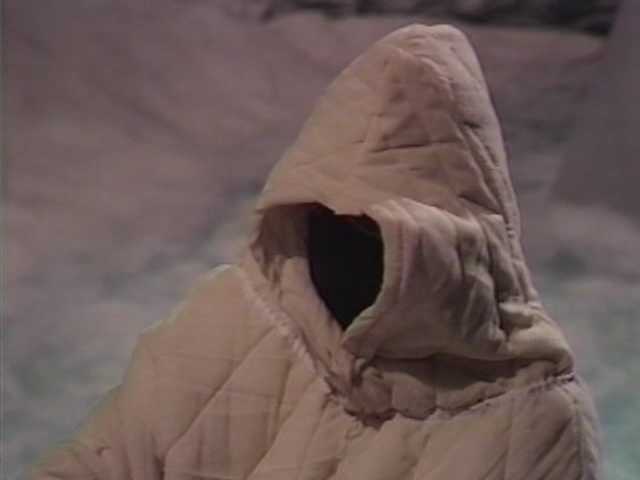 The arctic base on Kastria (as it is known) is inhabited by a couple of mysterious hooded figures facilitating the execution of treacherous war criminal Eldrad. Eldrad has been blasted into space and his rocket is due to be detonated, but conditions on the planet are getting worse, and the hooded figures are forced to do this before they’re ready. The looks on their faces say it all. I’m Bobbin. Are you my mother? There is a risk that a part of Eldrad may survive. You’ll never guess which part. Cut to Earth, some time later, and the Doctor and Sarah Jane emerging from the TARDIS. 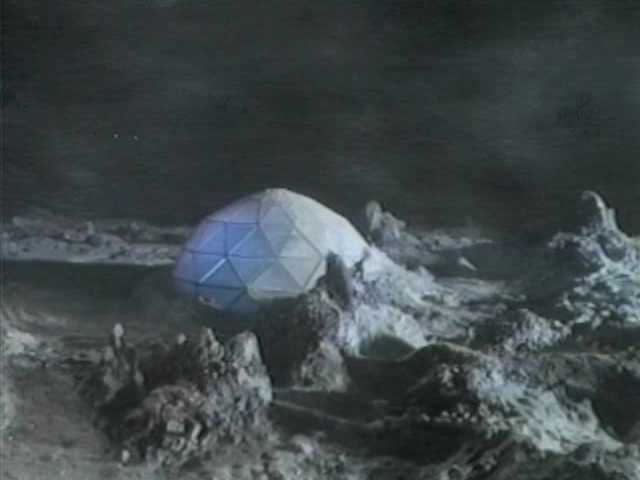 It’s traditional for classic Doctor Who to be set on rocky alien surfaces that happen to look like quarries, but this time – believe it or not – they’ve landed in an actual quarry, as Baker takes great delight in telling Sarah Jane (with more than a slight wink to the audience). The pair haven’t much time to sightsee, however, before they’re caught up in an explosion. 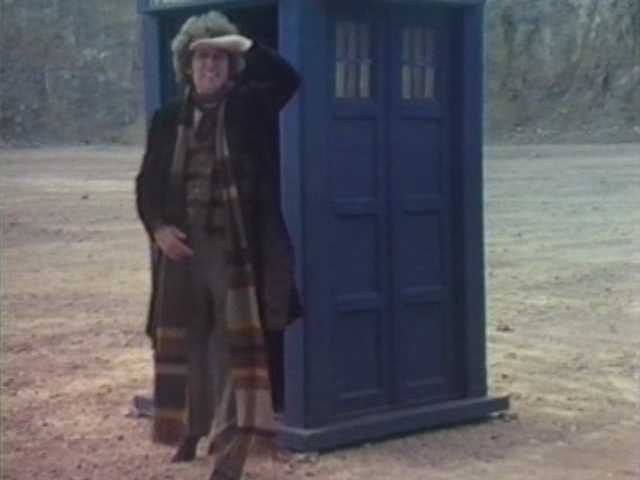 The Doctor escapes with minor injuries, but they have to dig poor Sarah out of the rubble. When they recover her, she’s clutching Thing from The Addams Family. Unfortunately, possession of the hand has some dastardly side effects, and when Sarah wakes up, she’s turned into Andy Pandy. Seriously, woman, what the hell are you wearing? 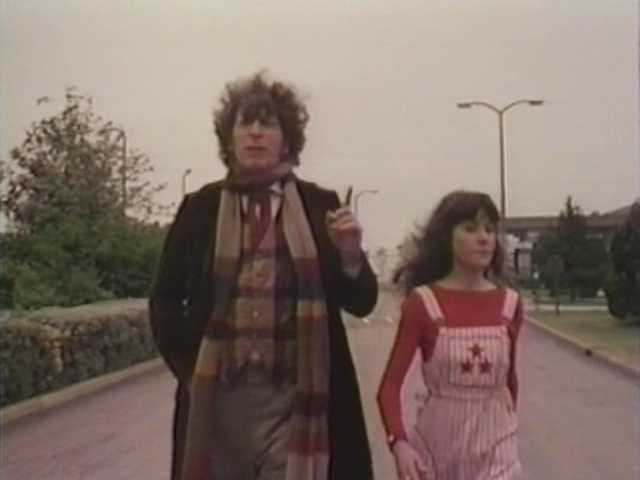 In her autobiography, Sladen notes that the increasingly ridiculous costumes were her way of putting a stamp on the character: Sarah Jane starts out relatively straight, but travelling with the Doctor has made her dress sense almost as erratic as his own. This is known throughout the Whoniverse and fan base in general as ‘The Andy Pandy outfit’, and indeed that’s how one of the scientists refers to her, just after she’s knocked him out and legged it out of the hospital with the hand. “Back up a minute”, I can hear you saying. “Did you say ‘knocked him out’? Has she let herself get hypnotised again?” To which I’d respond “Well, yes. It’s Sarah Jane. What did you expect?”. I make this the fourteenth, at last count. What’s special about this one, of course (aside from the fact that it’s her last) is the oft-quoted “Eldrad must live”, which became the line Sladen was most frequently asked to repeat over the years. If the internet had been around in those days, it would have become a meme. These days – well, actually, it’s a meme. Presumably there’s a t-shirt somewhere on Ebay. The hypnotised Sarah’s destination of choice is a local nuclear power station, which she enters with frightening ease, despite her newfound ability to knock people out by raising her hand. The Abba ‘You Can Dance’ Wii marathon wasn’t going Sarah’s way. Yes, I know it’s silly, but bear in mind that nearly three decades later the Doctor fixed a nano-virus by raising his hands and waving them around a bit. Recurring themes are important. The Doctor has been busy in the lab, but sets off in hot pursuit as soon as he finds out about Sarah. Unfortunately he doesn’t get there in time to stop her hiding in the reactor, and he’s forced to try and negotiate over the intercom. This is unsuccessful, because Sarah’s preoccupied with a colour wheel. Presumably it’s another side effect of the Andy Pandy thing. While all this is going on, the plant has entered meltdown, and it’s left to Professor Watson – who runs the place – to try and keep order. He chiefly does this by addressing the workers over the PA in the manner of a union boss. Glyn Houston. He stayed at his post when the trainees ran. I’ve not yet mentioned any of the story’s guest performers, so now would be a good time. Houston himself is probably the most watchable, taking the mandatory role of human-who-thinks-guns-would-be-a-good-idea, but for all his reliance on nuclear technology he’s rational, measured and brave, assisting the Doctor as much as he can and remaining in the complex even when it’s seemingly about to explode. He is assisted in his endeavours by Miss Jackson (Frances Pidgeon, who’d previously played a handmaiden in ‘The Monster of Peladon’). A romantic relationship is implied, but never really confirmed, and we like it that way. The other main human of note is Dr Carter, who initially works with the Doctor to find out the secrets of Eldrad’s hand, but who – like Sarah – winds up possessed by it. 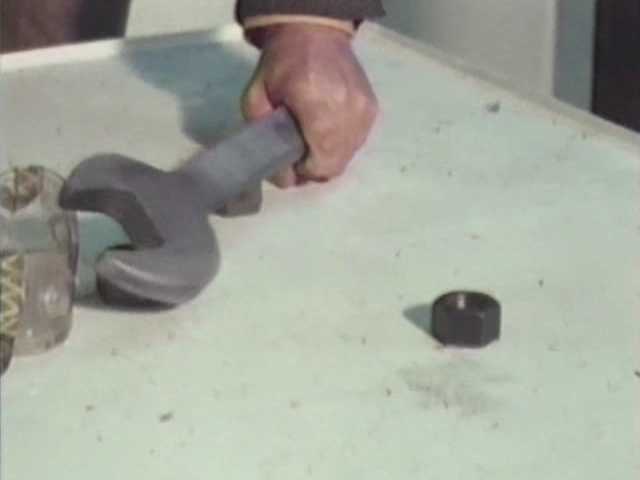 This gives the writers an excuse to screen what is possibly the most unconvincing fake spanner in living history. It’s cardboard, I tell you. It’s bloody cardboard. 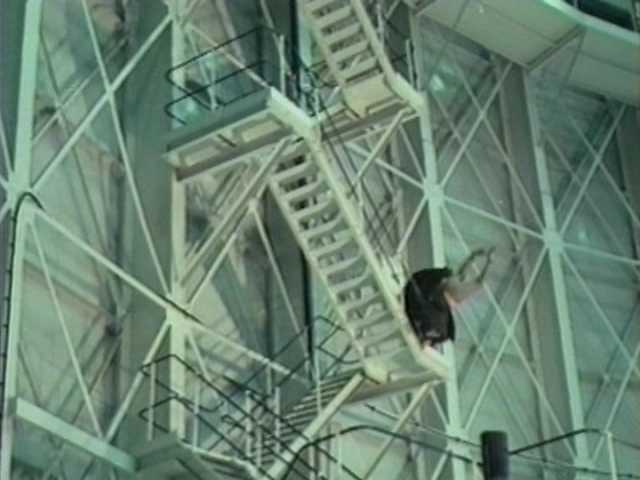 This, in turn, is followed by a fall from a metal staircase that actually looks more like an acrobatic flip. News of the local hosepipe ban brought the Olympic diving event to a premature end, but it was too late to inform the first of the competitors. Despite such setbacks the Doctor manages to get to the reactor, but Sarah isn’t coming out to play. Ooh, look at that face. It’s a face of pure deviousness. Suffice to say that Sarah is restored to normal, but not before events are set in motion to also bring back Eldrad. The military men outside take the conventional step of ordering a nuclear strike (which allows Baker the opportunity to swagger on the back of a truck, completely unconcerned about the radiation in one of those “You humans!” moments he did so well). Radiation, of course, is exactly what Eldrad needs to regenerate, although when he appears from his chamber, he’s apparently turned into Mystique. I am loathe, to be honest, to tell you any more. Suffice to say there are a couple of interesting twists, a drastic change in setting, and an innovative use of Baker’s scarf. Oh, and Roy Skelton, who’s always great. 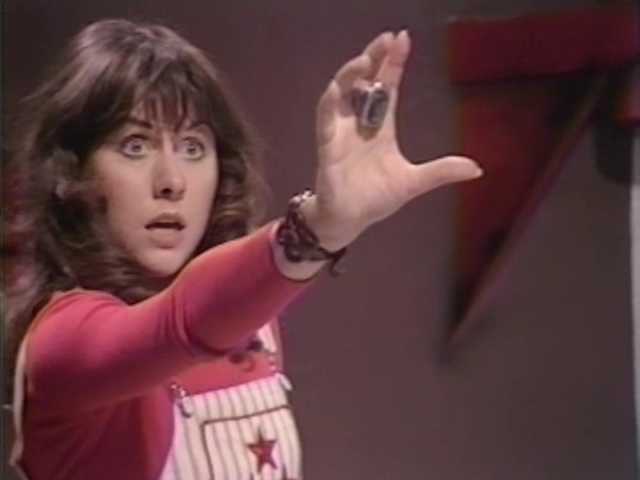 Perhaps part of the problem of the story is that you never really feel the world is under threat, because comparatively few of the characters take it seriously – Sladen, for example, is aware it’s her final role and hams it up mercilessly at every opportunity, never more so than when she’s under hypnosis. Baker, meanwhile, is laid-back and good-humoured – “Stop making a fuss, Sarah. 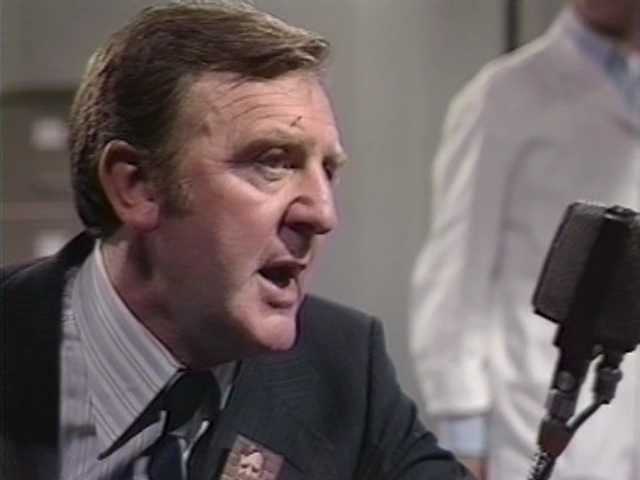 You’re from South Croydon” – dashing to and fro round the power station and watching Eldrad melt through the door of the reactor before remarking “This is intensely interesting, don’t you think?”. Simultaneously the Doctor gets a summons to Gallifrey, and he can’t take Sarah with him, so he has no choice but to return her to London. And Sarah tells us she’s bluffing – she doesn’t really want to go, she says. And at the same time somehow we know she’s had enough. And it’s this ambivalence which makes for the best scene in the story, touching in its brevity and in what it doesn’t say, as much as what it does. There is no tinkling piano, no mournful alto, no close-up of soulful eyes, no rain. There is, instead, a strained, slightly anxious parting in the TARDIS control room. Suitcase in hand, Sarah lingers near the door, knowing she has to face the inevitable, with the Doctor half turned away, and it is at this point that you realise both leads are no longer acting. There is a silence, with neither willing to actually make the jump, until Sladen remarks “Don’t forget me”, to which Baker responds “Oh, Sarah. Don’t you forget me.” And, of course, she never did. Last night, Joshua and Thomas and I watched ‘Journey’s End’. I say ‘watched’. The reality is that Thomas got bored and spent half of it doing headstands on the armchair. Joshua was taken aback by the regeneration that wasn’t, and then stomped around in a huff when there was no ‘next time’ trailer, although I think he was probably just upset about poor Donna. As for me, I sat there bemoaning the melodrama in the last fifteen minutes: there’s an earlier, very telling encounter between the Doctor and Davros in which the Time Lord’s pacifist sensibilities are challenged, even if it is hampered somewhat by Dalek Caan behaving like Johnny the depressed artist from The Fast Show. And there’s the crowd-pleasing moment when Sarah Jane, cornered by Daleks, is saved by none other than Mickey Smith, holding an enormous gun. And then there’s that stupid, stupid scene on the beach. And lots of hugging. And then Tennant redeems himself by a final, wordless scene in the TARDIS when he looks genuinely upset at the departure of the Most Faithful Companion, and you remember that given the space that New Who rarely provides, he can turn in a fine performance. It’s a missed opportunity, but it did get me thinking again about something I’ve been tinkering with for a while – a collection of those moments which have genuinely lived up to their promise, the moments that single out Doctor Who as first-rate television, the ones that make the clip shows and the award ceremonies. The ones that make you cry, or – in the case of the examples I’m about to provide – the ones that make you want to shout with glee. This is not a definitive list (hint: your comments welcome), nor is it exhaustive (there are plenty in Classic Who, and one of these days I’ll get to them). 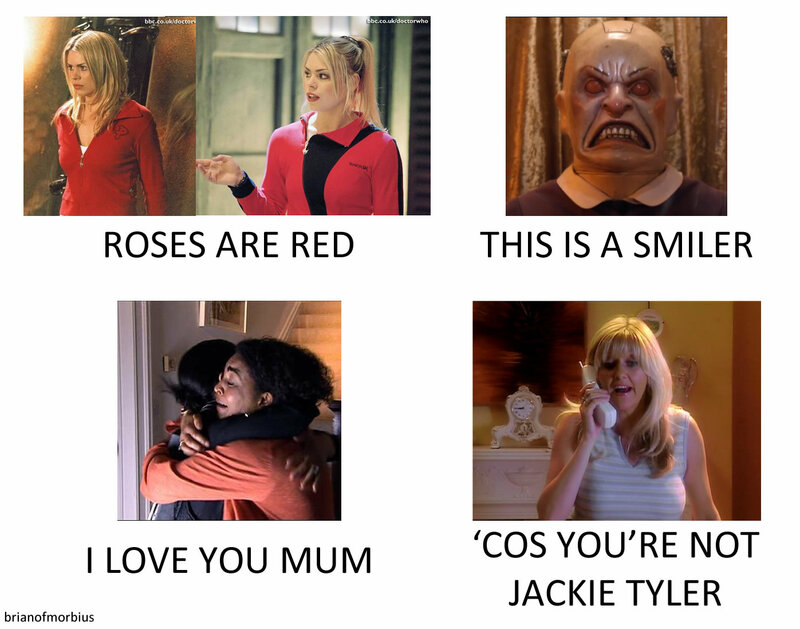 But here, in no particular order, are my top seven Doctor Who moments that make you go “Yes!”. Once upon a time, in the days before space-bound spitfires and silly dolls, Mark Gatiss wrote decent episodes of Doctor Who. This is the second (his first was ’The Unquiet Dead’, which I love), and the cracks are already beginning to show – there’s a lot of self-righteous cockney blustering and some absolutely excruciating dialogue between Rose and the Doctor at the beginning of the story. 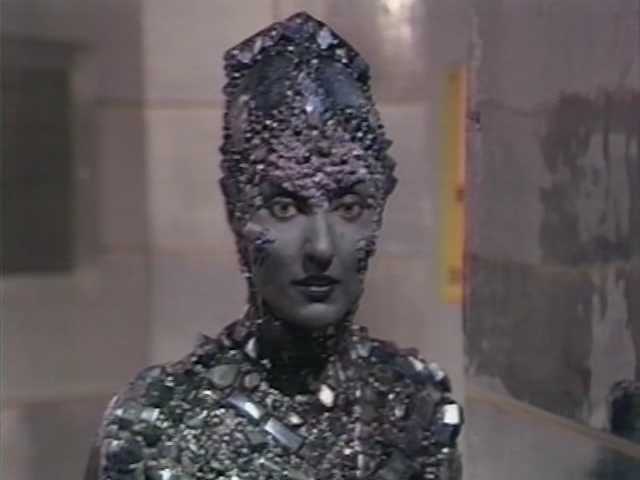 But in its favour, ‘The Idiot’s Lantern’ has Maureen Lipman, as well as sensitive support from Rory Jennings and Sam Cox, and one of the most exciting finales to any of the New Who stories. As the Wire gets on with sucking off the faces of the entire TV-watching population (the phrase ‘glued to the screen’ seldom seemed so apt), Tennant ascends the side of a transmitter in an attempt to wipe out the signal. There are obvious parallels with the ending of ‘Logopolis’ here, and that may have been the reason why, for the first time since 1987, I genuinely feared for the safety of the Doctor. You know it’ll all end well, and of course it does, but it’s a bumpy ride, and all the more satisfying when he inevitably triumphs – by capturing her on a Betamax cassette. The Angels have everyone surrounded. There are tons of them. They’re vicious killers, which is new. They also appear on video. Basically things don’t look good. 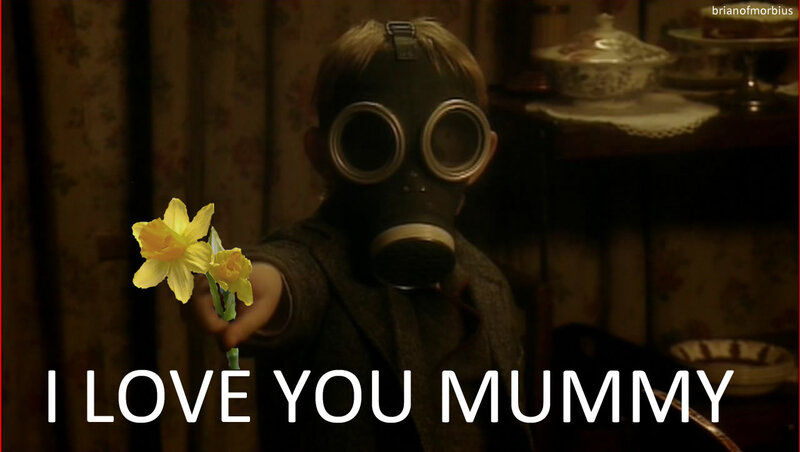 The creative decision to have them speak was controversial but, unlike the other change Moffat made in these episodes, it worked – it did, if nothing else, help us to understand their malevolence. But they’ve made a mistake by trapping the Doctor, because there’s one thing you never put in a trap, and that’s him. This is the first cliffhanger episode and as such it’s the first time we see Smith’s Doctor well and truly cornered, so it’s nice to see him respond in this way. So good, even a dancing Graham Norton can’t spoil it. Doctor Who’s always been a bit awkward about predestination. Hartnell bleated that “You can’t change history – not one line” and it’s long since been the show’s ethos: basically everything the Doctor does is pre-ordained. Hence things happen in history because he’s there to stop them, not because he pops in to change them, and it’s the wisdom of being able to tell the difference between pre-ordained action and meddling that makes him the tedious demi-God that has he thus become in recent years. (It’s a quality that his companions – being human – singularly lack, which is why the Doctor presumably calls them ‘stupid apes’.) But in this instance, Donna is right: Pompeii happened, and it’s clear from this that it was supposed to happen, but there’s nothing in the history books about a mysterious stranger saving a random family because no one would have believed it. This makes the Doctor’s rescue – bathed in white light, beckoning Caecillius and his wife and children into it as if lifting them from the depths of hell – all the more plausible, and the moment when he changes his mind and goes back for them is really very satisfying indeed. Seldom has the sound of the TARDIS’ materialisation been quite so welcome. There are cliffhangers and there are cliffhangers. And then there’s this: a companion-in-peril moment that you expect to end in a look of abject horror, with a wide-eyed stare and a cry of “DOCTOR!”. Instead, Eccleston shows how, for all the arm-folding and grinning, he really was quite good at times: a Time Lord outmanned and outgunned and with no possible way he can win, but who is determined to go down fighting. The end result is goosebump-inducing. Accompanied by some of Murray Gold’s best music, the Doctor refuses to allow them the satisfaction of an easy surrender – and when he tells Rose’s captives the he’s going to rescue the girl, save the Earth and then, just for good measure, “wipe every last stinking Dalek out of the sky”, they believe him. And, crucially, so do we. A lot of people despise this episode. 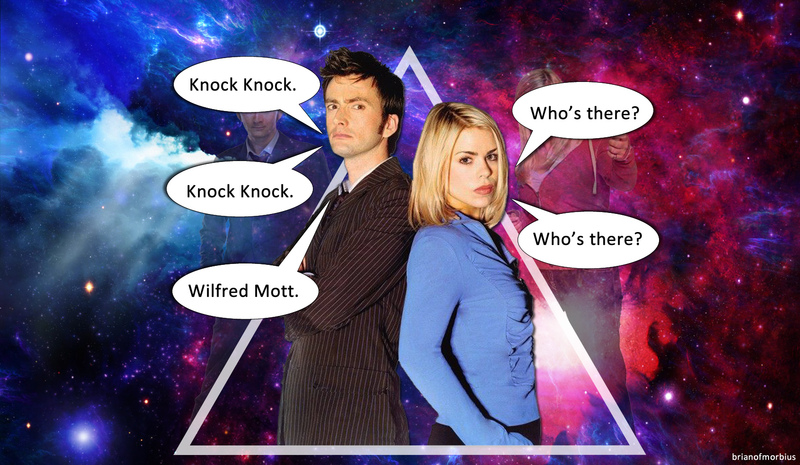 I think it’s a highlight of the sixth series, eclipsed in sheer brilliance only by ‘The God Complex’. The saga of the Doctor’s attempt to rescue Amy is muddled and confusing and refuses to explain why its supporting characters are there (only that they owe a debt to the Doctor, which Moffat’s no doubt going to come back to later), and there are ephemeral references to bow ties and the most ridiculously contrived (and thoroughly anticlimactic) ending you could imagine. But before any of that, there’s this: a stomping opening scene in which a captive Amy reassures her infant daughter that she’ll always be safe (Oh, Amy, if only you knew), because her father’s on his way. And Rory – wearing his gladiator costume for no really good reason, but let’s ignore that – stomps onto the bridge of a Cybermen warship, properly angry for perhaps the first time ever, and asks for the location of his wife. Never mind the ethics of the Doctor blowing up an entire fleet simply because he can – this is mind-numbingly good stuff. The first Moffat Who story is a curious beast. It’s Jekyll / Hyde in nature, with a frightening, turbulent first half that features a strange, zombie-like child who can manipulate the telephone lines, and one of the most startling transformation scenes in the entire canon. And then, in part two, Moffat goes into zany screwball comedy mode. 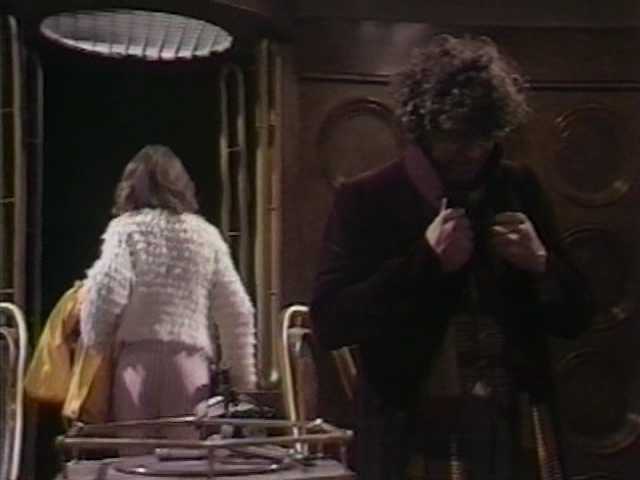 There’s an amusing denouement to the cliffhanger, when the Doctor frightens off the infected mob by telling them to go to their room, only to quip “I’m really glad that worked. Those would have been terrible last words”. 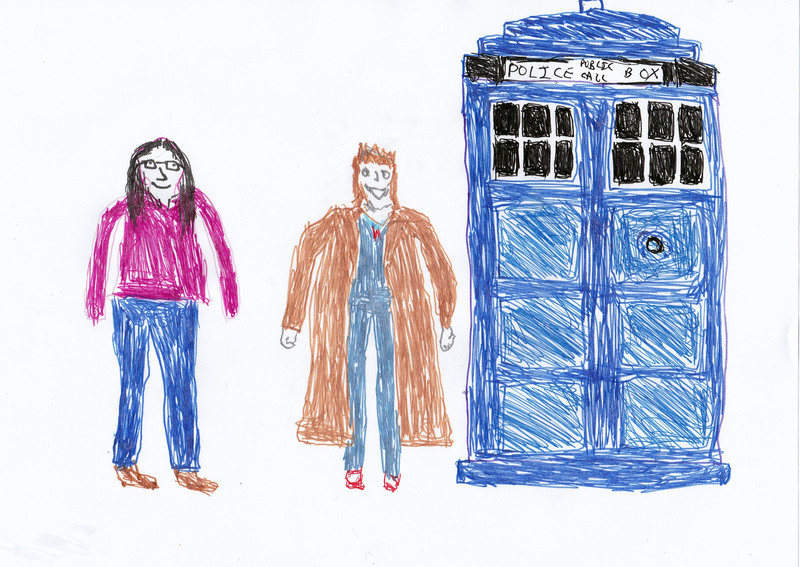 Then there are jokes about ears, bananas and the Doctor’s weapon of choice (“Who looks at a screwdriver and says ‘Ooh, this could be a little more sonic’?”). There’s a kind of infectious joy about it, despite all the end-of-the-world palaver, and it all comes to a head in this closing scene, which sees the Doctor save the day by thrashing his arms around in a display of literal handwavium, but the zero body count for the story is rare and refreshing, and even if much of the dialogue is corny, the sentiment is heartfelt and appropriate. “Just this once, Rose,” cries the Doctor triumphantly, “Everybody lives!” – and it’s hard not to cheer along with him. Yes, yes. I know everyone loves the fish custard scene, and that bit on the rooftop (“Hello. I’m the Doctor. Basically…run”). But my own air-punching moment came right at the end of this episode. It had been a dazzling tour-de-force from Smith, who spent an hour running around being manic and silly, in the days when Moffat’s scripts had him mostly doing that instead of acting sad and world-weary (which Smith also does very well, it’s just it’s less interesting to watch). So scrub to 2:44 and watch from there, because it’s the moment when you realise that even though he lets other things get in the way, Moffat still understands who he’s writing about and what the show represents. And when the Doctor announces, drily but with a wide-eyed gleam that he is, indeed, a madman with a box, I knew that Smith had nailed the part, and that I would love him. And I still do. The Doctor’s real name must never be announced. Never. We will at some point throw in ‘Theta Sigma’ as an old college nickname because some people will probably be stupid enough to think that’s who he really is. If the Doctor kisses anyone, it doesn’t really count. (cf. ‘Journey’s End’, where the kiss is performed by a human Doctor clone, ‘, or ‘Family of Blood’, where he’s lost his memory.) The Doctor himself, on the other hand, may be kissed by someone else for awkward comic relief effect, as often as necessary. Anyway. Leaving aside the romantic slush, have you noticed the bear hugs? There are a lot. I mean an awful lot. There are comedy hugs, unnecessary hugs, farewell hugs laced with dramatic irony, bittersweet hugs, hugs that you really want to see develop into something else and hugs that you frankly didn’t want to see at all (Jack? I’m looking at you. Now sit down and put it away). Doctor Who has become very dark over the years, but there are moments of light and fluffiness, and when you put them all together it’s a bit like chomping through an economy size bag of Haribo: over in a flash, because they’re so compulsively moreish, but you feel sick afterwards. About twelve years ago I was doing hospital radio. Our status as a registered charity meant we could play more or less what we wanted, within certain ethical parameters, and one of my favourite records to play on a Saturday was ‘Thank You For Being A Friend’ (notably used as the theme from ‘The Golden Girls’), which at the time I absolutely adored. It took a few years of detachment for me to realise that it’s a dreadful, dreadful song – it’s almost inconceivable that the man who could have penned ‘Lonely Boy’ could have come up with something so dire. (I actually blogged about this quite extensively some years back, so there’s no point going into my particular hang-ups again.) But when I was twenty and naïve, it was the best song in the world. At some point I went off it, and the CD then spent the best part of a decade on its shelf, sandwiched between Genesis and Goldfrapp, a safe distance away from anything that could turn those little bits of data into recognisable sound. Then, when Andrew Gold died last year (somewhat prematurely, at the tender age of 59) I listened to it again, and realised it held a certain kitsch value. It’s nicely produced and competently performed; it’s just the sentiment I can’t stand. At the time I was in the middle of another Who video – that’ll come next week – but I suddenly had the idea of combining two different types of cheese. 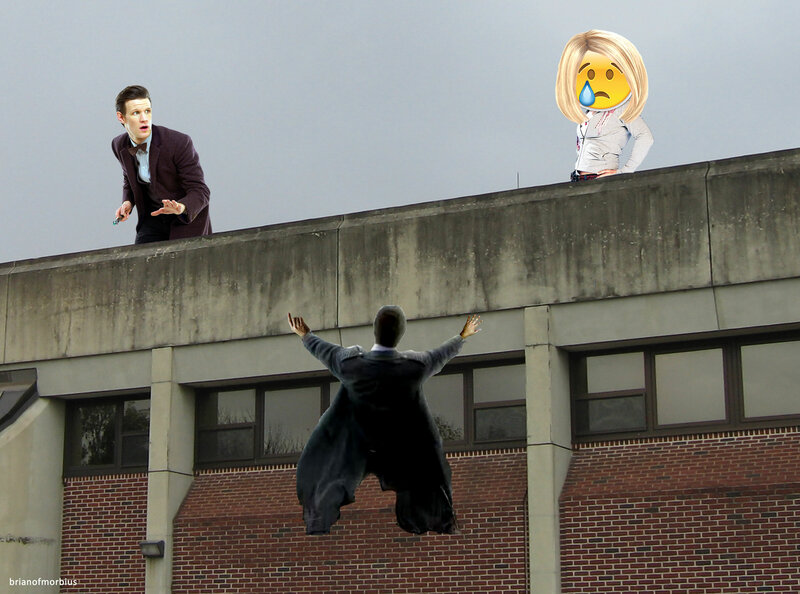 Because it strikes me that the Barney-like hugging of the family-friendly Whoniverse that Tennant’s Doctor inhabits – encompassing a whole network of allies and spinoff shows – was perfect for a montage. As a result this was extremely easy to put together, at least in terms of finding suitable clips, because it was just a question of forwarding through to the end of each episode, which is when the mushy stuff invariably happens. Andrew Gold’s back catalogue is owned by the UMG, and their somewhat draconian stance on copyright meant that I originally couldn’t post this on YouTube, because it was blocked worldwide. I have thus placed it on Viddler instead, as recently as this evening when I uploaded a new version that got rid of a couple of old glitches that annoyed me. Looking at it again, I’m conscious that it didn’t actually start out as a love story – that was never my intention – but in some respects that’s basically what it became. A bit like my life, really. Happy Hallmark Day. Edit, 3 Feb 2013: the UMG copyright stance appears to have shifted somewhat – I had a go at uploading this yesterday, purely on a whim, and it got through! The link has been updated as a result.